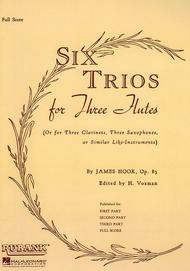 Composed by James Hook (1746-1827). Edited by Himie Voxman. Arranged by Himie Voxman. Ensemble Collection. Baroque, Classical. Full Score. 36 pages. Published by Rubank Publications (HL.4474630). This unique 18th-century collection of pieces for flute by James Hook has been completely revised and edited for intermediate to advanced level instrumentalists. Each is a three-movement work in typical fast-slow-fast Baroque format. Suitable for contest, concert or church performance, these pieces appear on several state contest lists. Wonderful. I borrowed a copy of an older print at the library, but this is on such nice white paper it makes it much easier to see the tiny print. I only wish the score and parts were in larger print. 13 of 38 people found this review helpful. March 06, 2009 Each suite is worthy! As I performer with a renaissance flue trio, this music offers a lovely variety of suite after suite. And as a teacher, the music is perfect for my intermediate students. The price is incredibly low for the material received. 23 of 46 people found this review helpful. May 19, 2008 A Charming Baroque Trio Work-Out! It's easy for advanced players to sight-read -- re: predictable 8th and 16th note patterns. Strong melodies, nice 2nd & 3rd flute harmonies. And it's nice practice for baroque interpretation. The price was excellent for six very lovely trio's! Lots of music! 22 of 46 people found this review helpful. they sound very Flutey. We learned them all and use them regularly when we perform. 26 of 50 people found this review helpful. October 24, 2006 Works well on Recorders too! These are fun trios and easy to play. They are a great introduction to baroque style for early intermediate players.